WLAN mesh systems are currently ubiquitous. Every manufacturer has at least one system, if not several. At one point, however, all systems resemble each other, the hefty price and the great promise of performance. I have already tested some Mesh WLAN systems and therefore have a quite well-founded opinion about such systems, which I would like to announce here. So are Mesh WLAN systems really recommendable? Xiaomi has introduced the Mesh Router Suits, which are designed to provide a cellular wireless Wi-Fi system. The set includes two routers. The devices can operate in two frequency bands – 2.4 GHz and 5 GHz. IEEE 802.11as is supported. It is important to note that each frequency range has its own amplifier. This provides good coverage and improves the signal flow through walls. Several WAN/LAN ports are available. It is noted that the wired computer network cable can be connected to any of these connectors, after which the other ports switch to LAN mode. The Xiaomi Mesh Router Suits system is extremely easy to set up. Users only need to connect an Ethernet cable and power cord, activate wireless communication on their smartphone and run the Xiaomi Wi-Fi App, which will allow them to set all the necessary parameters step by step. The gadget is quite compact: its overall dimensions are 18.10x12x8 cm with a weight of only 600 grams. 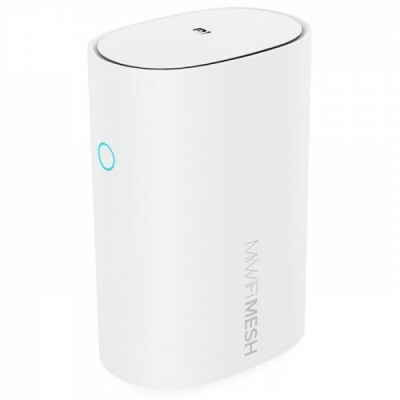 Well, let’s be patient and wait for this promising, ambitious and cool Mi WiFi Router MESH to complete beta testing!